Could 2017 be the year of ruggedness for phones? The Ulefone Armor is a great introduction to the world of rugged smartphones. It is affordable, relatively powerful, and comes with an array of features that are usually found on far more expensive handsets. Like mechanical keyboards and lousy GIFs, rugged mobile handsets are now making a comeback as vendors try to differentiate their offerings from each other while making sure they add enough compelling features to ensure a reasonable profit margin. Chinese handset manufacturer, Ulefone, has joined in the fray with the Armor, a mid-range 4G smartphone that adds IP68 to its credentials. Available in bright orange or black, the Armor costs as little as £128 (about $155, AU$215) direct from Gearbest, the online retailer that provided us with the review sample. A premium of about 13% will be added if you want to get the smartphone faster and without the risk of getting taxed. The Armor comes with a USB cable, a small screwdriver and a 2-pin plug. Couple of points here: the charger is a 5W (5V1A) one which guarantees longer charging times. The USB cable has a longer plug to account for the thickness of the protective rubber casing. There’s also a yellow 3.5mm audio extending, flexible cable with a longer protruding connector to eliminate any issues caused by the thicker enclosure. Speaking of the chassis, we found it to be thinner than expected at about 11mm. Made mostly out of rubber and plastic (TPU/Polycarbonate) with a small bit of metal at the bottom, it appears solid enough to merit an IP68 rating. A word about Ulefone’s hardening process – the Armor surpasses IP68’s requirements when it comes to waterproofing as it can, according to the manufacturer, be submerged for 30 minutes at 150cm without getting damaged, that’s an extra 300millibar of atmospheric pressure. Waterproofing is achieved courtesy of a waterproof film, a waterproof gum and the outermost shell. Likewise, ports like the earphone or USB connector will not be damaged if they get wet. Just make sure that they are completely dry before connecting any items to them. The Armor is put through 20 tests including a tumbling and contortion test, while the screen uses Corning Gorilla Glass 3 technology to protect from (light) scratches. Ulefone also claims that the Armor can be used between minus 40 degrees and 80 degrees. The input ports and the power button are located at the top of the handset, hidden behind a rubber flap, while an SOS button and a dedicated camera button can be found on the right. There is a notch at the bottom of the Armor but it doesn’t seem to serve any purpose. On the right are a pair of volume buttons and on the front are three physical buttons which are great when you use gloves to handle the device, as they give you some feedback. The buttons – especially the power button – require a bit more force to activate. Ulefone doesn’t disappoint when it comes to the hardware, too. It’s opted for an 8-core system-on-a-chip, the Mediatek MTK6753, clocked at 1.3GHz. It certainly won’t break speed records but should provide enough power for most tasks. Oh and it does support the all-important 800MHz/Band 20 frequency, essential for Giff Gaff, Tesco, O2 and now Sky Mobile. More surprising though is Ulefone’s decision to add 3GB of RAM and 32GB on-board storage. We were expecting the usual 2GB/16GB combo so this was certainly a pleasant surprise. Up to 128GB of storage can be added via a microSD card. To keep the Armor reasonably portable (remember, it’s 75mm wide and 150mm long), Ulefone opted for a 4.7-inch display with a HD resolution which translates into a 312ppi density, which is just below what is commonly accepted as ‘Retina Display’ pixel density. The rest of the specification points to an average, albeit solid, midrange handset: Android 6.0 with a proprietary skin, dual SIM cards (hidden under a plastic cover), NFC, 802.11n Wi-Fi, Bluetooth 4.0, FM Radio, a 5-megapixel front-facing camera and a 13-megapixel one at the back, located next to the speaker. So there’s no fingerprint reader or USB Type-C connector but the 3,500mAh battery goes some way towards making up for this. Ulefone promises up to two days of normal use and up to 300 hours (or just over 12 days) in standby mode. One last thing worth noting is its weight. At 193g, this handset is lighter than what you might expect from a rugged smartphone. In a niche that is becoming more and more crowded, UIefone has managed to produce a surprisingly decent little performer. The Armor doesn’t cost a lot more than a non-rugged smartphone, and yet packs in some interesting features almost unheard of at this price, like 3GB of RAM, 32GB on-board storage, and simultaneous use of microSD and nanoSIM cards. There’s plenty of competition though, like the DeWalt MD501, the Blackview BV6000, the Cat S60, not forgetting the Samsung Galaxy S6 Active and S7 Active. 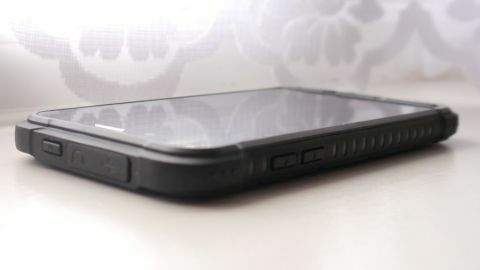 None achieve the price/feature combination of the Armor, but the BV6000, with a more rounded offering and more powerful system-on-a-chip, comes very close – this phone remains our preferred option, and it’s well worth spending a bit extra on it. At any rate, back to the Ulefone Armor – we certainly miss the notification lights, and the killer combo of bigger screens/higher resolutions you can get elsewhere. Still, there are no single deal breakers in sight and its price – the cheapest of the IP68 smartphones on the market – makes it a bit of a no-brainer for those who want an affordable ruggedized smartphone.